Powerful, efficient, and reliable, MegaTherm® pool heaters are designed for commercial, institutional and large residential pools where economical performance and rapid heat-up are required. Available in indoor and outdoor models in both natural gas and propane. MegaTherm is design certified to the ANSI® Z21.56 Standard for Gas-Fired Pool Heaters. (Outdoor 500-1825 units are certified for use without the addition of a draft diverter or external vent. 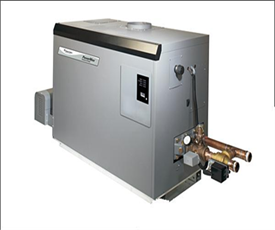 Indoor units incorporate a built-in draft diverter and require only vent piping.) Salt water models (500-1825) are available with cupronickel alloy heat exchanger tubes and bronze headers and header covers. Heating efficiency rating as high as 82%. Available in sizes from 500,000 btu to 5,000,000 btu. When performance is critical, the PowerMax® heater provides peak efficiency and easy maintenance in both indoor and outdoor applications. Seven sizes delivering up to 85% efficiency ratings and meeting all Low NOx requirements. PowerMax is designed for operation to 10,000 foot elevation. 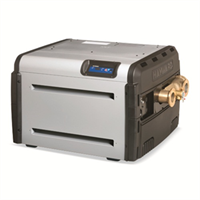 Available in both natural gas and propane models from 500,000 to 2,000,000 BTUs. 200/208 and 575 Volt models are available. Heating efficiency rating as high as 85%. Available in sizes from 500,000 btu to 2,000,000 btu. With an impressive 95% heating efficiency rating, the Hi-E2 outperforms any other gas heater, which means it can reduce operating costs by 30% or more. 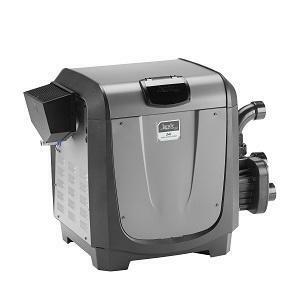 This ultra-efficient, low-maintenance heater is the perfect choice when considering economic operation or an extended swimming season. Dual thermostat controls make this an excellent solution for pool and spa combination's. Heating efficiency rating is 95%. Available in one size of 350,000 btu. 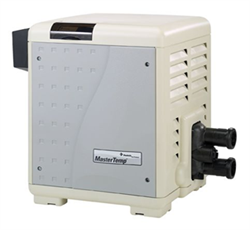 MasterTemp®s offer all the efficiency, convenience and reliability features you want in a pool heater, plus a lot more. As easy to use as your home heating system, plus, user-friendly indicator lights make system operation and monitoring a snap. The compact design and super quiet operation won't intrude on your poolside leisure time. Heavy-duty (HD) unit with cupro-nickel exchanger stands up to the harshest of applications, like low pH, high flow or heavy use. Heating efficiency rating ranging from 81-84%. Available in sizes from 175,000 btu to 400,000 btu. 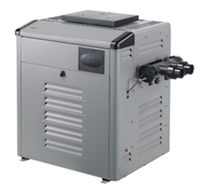 The JXi high-efficiency, low-NOx JXi pool and spa heater is offered in both natural and propane gas models. Ultra-compact, 2'x2' footprint for small space requirements and maximum installation flexibility. Lightweight design, weighs less than 126 pounds unpackaged, for easy maneuverability and transport. Low-NOx design surpasses strict DOE energy-efficiency requirements. Automatic actuation of flow bypass valve is based on call for heat and does not require human interaction. The flow bypass valve is integrated into the JXi's header, requiring no external plumbing modifications. Heating efficiency rating ranging of 83%. Available in 3 sizes from 200,000 btu to 399,000 btu. When you want quality, strength and durability, you want the corrosion resistance of titanium. 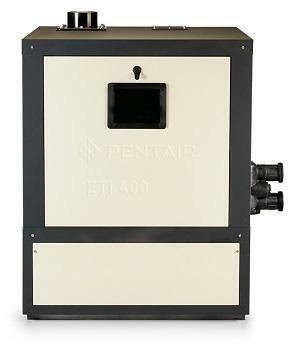 The ETi 400 is the world’s first heater with the TitanTough™ direct-fire pure titanium heat exchanger for long-lasting, thermal and energy-efficient heat. 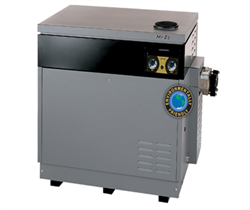 The Hayward Universal H-Series ASME gas heater is the universal energy efficient remedy for any new or existing semi-commercial pool or spa application. An industry leading hydraulic design reduces circulation pump run time to provide energy savings of up to 18%. Available in 250 or 400 thousand BTU, natural gas or propane models. 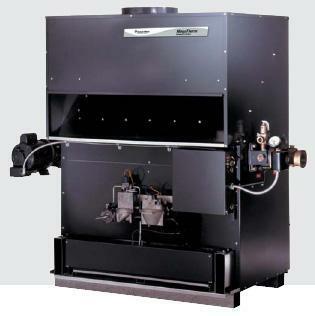 The atmospheric Legacy heater builds on Zodiac’s long-standing tradition of excellence in gas heater design. Built to last and loaded with technologically-advanced, user-friendly features. Legacy heaters are an energy-efficient, economical pool heating solution. Raypak Heaters and parts are available by custom order from our locations. If you require something for a Raypak heater please feel free to contact us. We strive to make your pool operating experience better. If there is anything we can inprove upon please feel free to contact us. We can renovate, design, or even answer a few questions.